146/365(+1), a photo by Luca Rossini on Flickr. 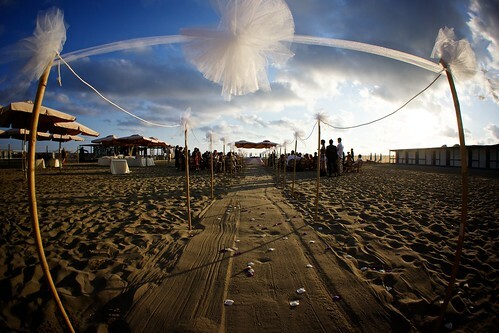 What’s more romantic and fun than a wedding on the beach at sunset? Not much, I guess. Yeah, probably a tropical beach. But sunsets here at Fregene, twenty minutes drive from Rome, are pretty spectacular too. The couple of this wedding is young and beautiful. We arrived at their nice home in Fregene, a typical summer-house with a nice view over the countryside. The air is fresher, cleaner, and quieter than anywhere in Rome. The bride is gorgeous in her hairstyle and makeup, and once she puts on her classy white dress she simply looks fantastic. I needed a few seconds to start breathing again before being able to shoot any photos. I am not joking. Then we all moved to the beach. The place was beautifully decorated as in any of those tropical-beach-weddings I’ve seen on movies. Their friends are all very edgy, lots of tattoos and peculiar haircuts. They were all wearing quite stilish suits and dresses. While on the beach. At sunset. I couldn’t have asked for any better, juxtaposition has never been so easy to get. When the ceremony ended, we had a little walk with the couple on the foreshore. The guests where all well behind us, enjoying the aperitif. The shores at Fregene are very broad. I don’t get to see very often a bride in her white dress running on the beach, jumping in the water, standing on a rowboat, and hugging her groom while watching the red sun sinking in the sea. Sunset was over, we all moved to the aperitif, then we enjoyed a delicious dinner and a great party. I can’t simply thank enough the couple for their kindness and for the great evening they gifted us with. I wish them to keep their mind young and fun as they are forever. You tell us about a girl so beautiful she literally took your breath away and then don't show us what she looks like?! TEASE!! Tease indeed! The fact is simple, I had only the fisheye on my nex-7 and such a beauty couldn't be depicted by a deforming lens… I took several nice portraits with the 85mm on my a900, though. I'll post them on our facebook page sooner or later. Ah, well she was an attractive women as well 🙂 Oops I posted on the wrong entry, now your weddings are confusing me as well. I meant the Maura from the wedding on Saturday! Yes for the best, sorry about that!